Overripe bananas make delicious banana bread, but timing your purchase so the bananas reach the right stage of ripeness just when you want to start baking can be tricky. Growers intentionally ship under-ripe bananas to lengthen their shelf life, and it's not unusual to find only green bananas in stock at the grocery store. Don't let that deter you, however. You can speed the process on your kitchen counter with a simple paper bag or instantly ripen bananas in your oven. Some fruits, including bananas, produce ethylene as they ripen. The invisible gas then promotes further ripening, making it a useful tool for speeding the process in fruits that get harvested and sent to market before they reach optimal ripeness. 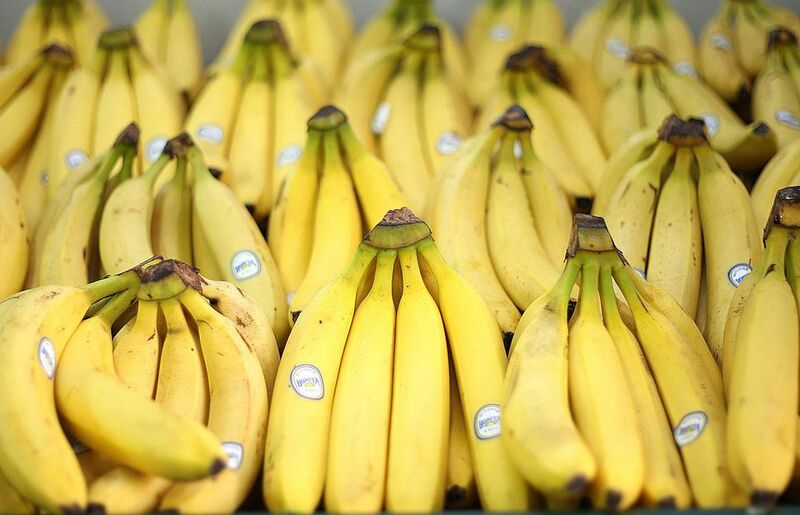 Ethylene helps convert starch into sugar, giving the fruit its characteristic sweet taste, and in the case of bananas, softening the flesh and turning the peel yellow. To ripen green bananas for eating out of hand, put them in the warmest area of your home. Good locations might be near a heat vent, on top of your refrigerator, or next to a sunny window. Depending on the stage of ripeness when you bring them home from the store and how you prefer to eat them, it may take anywhere from 24 hours to four or five days to ripen a green banana without any other intervention. Note that bananas ripen more quickly in a bunch, so leave them together unless you want to delay the ripening of some. To speed the ripening process, put the bananas in a paper bag and loosely fold down the top. Add an apple or a couple of already very ripe bananas to the bag to increase the amount of ethylene gas circulating around the green fruit. The bananas should ripen in just a day or two using this method. To immediately ripen bananas for use in banana bread, cake, or other cooked dishes, put unpeeled bananas on a foil-lined baking sheet. Bake them at 300 degrees Fahrenheit for 15 to 20 minutes, or until the banana skins turn completely black all over. Let them cool, then scoop the banana pulp from the peel and mash it for your recipe. You can soften bananas for use in recipes in the microwave too, but this method does not improve the flavor or increase the sweetness of the unripe bananas, so you may need to increase the sugar in your recipe to compensate. This method works better with partially ripened fruit than fully green bananas. Peel the bananas and place them on a microwave-safe plate or bowl. Heat them on high just until you hear them sizzling, about 30 seconds. If you bring home too many bananas and some start to turn brown before you get a chance to eat them, pop them into the freezer, peel and all, for the next time you get a hankering for banana bread.